Why a team of Scottish mountain rescue volunteers put their faith in the all-wheel-drive capabilities of the Toyota Hilux. Western Toyota and Arctic Trucks used Hilux to highlight key lessons of expeditionary vehicle maintenance. 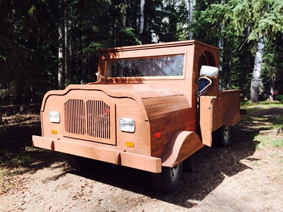 Toyota fan Brymer Mugford from Alberta Canada took nine months to build a pick-up truck made from spruce trees. Our final installment of posts from the #RAVTour of Britain’s ultimate roads looks at some of the spectacular sights we took in during our 1,250 mile trip. If you want to explore Britain’s ultimate roads like us, here’s where to go. Highest, lowest, steepest, oldest, bendiest, most undulating and everything in between – the #RAVTour has seen us explore 1,250 miles of Britain’s ultimate roads, and breathtaking scenery. Here’s a wrap-up. We test the go-anywhere capabilities of the Toyota RAV4 by driving on the UK’s most extreme roads. Follow the action on Twitter using #RAVTour. The Hilux deservedly has a reputation for being one of the toughest vehicles in the world, so we’ve compiled a list of 10 reasons why the enduring pick-up rules the earth.